The state of South Dakota offers excellent fishing for big walleyes, bass, crappies, catfish, perch and more. Plus find lots of great places to fish for them, including big lakes, small ponds, streams and rivers. Here, you can fish for many species, including largemouth bass, smallmouth bass, channel catfish, flathead catfish, blue catfish, black crappie, white crappie, walleye, rainbow trout, cutthroat trout, brook trout, brown trout, lake trout, bluegill, green sunfish, pumpkinseed sunfish, rock bass, spotted sunfish, white bass, yellow perch, coho salmon, chinook salmon, longnose gar, muskie, northern pike, paddlefish, sauger, sturgeon and tiger muskie in local lakes, rivers, ponds and/or streams. This chart shows the major fishing waters in South Dakota, cross referencing these waters with the major types of fishing to be found in each of the lakes or impoundments. For a more complete list of fish species in South Dakota, see the list below, which also includes state records. Angostura Reservoir is a 4,800-acre lake in the southwest part of the state, 5 miles south of Hot Springs, SD. Belle Fourche Reservoir is an 8,000-acre lake in the west-central part of the state, at Belle Fourche, SD. Big Stone Lake is a 12,600-acre lake on the eastern border of the state, at Big Stone City, SD. Bitter Lake is a 3,600-acre lake in the northeast part of the state, at Waubay, SD. Lake Albert is a 3,600-acre lake in the east-central part of the state, at Lake Norden, SD. Lake Francis Case is a 100,000-acre lake in the south-central part of the state, running from Fort Thompson to Pickstown, SD. Lake Kampeska is a 4,800-acre lake in the east-central part of the state, at Watertown, SD. Lake Madison is a 2,800-acre lake in the east-central part of the state, at Madison, SD. Lake Oahe is a 370,000-acre lake in the north-central part of the state, running from Pollock to Pierre. Lake Pelican is a 2,800-acre lake in the east-central part of the state, at Watertown, SD. Lake Poinsett is an 7,900-acre lake in the east-central part of the state, at Stone Bridge, SD. Lake Preston is a 5,400-acre lake in the east-central part of the state, at Lake Preston, SD. Lake Sharpe is a 55,000-acre lake in the central part of the state, running from Pierre to Fort Thompson, SD. Lake Thompson is a 15,000-acre lake in the east-central part of the state, at De Smet, SD. Lake Traverse is an 11,200-acre lake on the eastern border in the northeast corner of the state, 10 miles east of Sisseton, SD. Lake Whitewood is a 4,700-acre lake in the east-central part of the state, at Lake Preston, SD. Lewis And Clark Lake is a 31,000-acre lake on the southern border of the state, from Yankton to Springfield, SD. Shadehill Reservoir is a 5,100-acre lake in the northwest part of the state, at Summerville, SD. Waubay Lake is a 9,600-acre lake in the northeast part of the state, at Grenville, SD. To many, it's known as the Mount Rushmore State. To walleye anglers, it's walleye paradise. 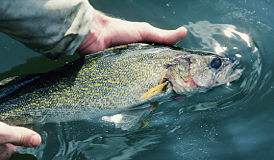 Click here for information on walleye fishing in South Dakota. The South Dakota Game, Fish and Parks website offers a great deal of information about fishing in South Dakota. Click here for a South Dakota fishing license. Excellent largemouth and smallmouth bass fishing opportunities are available to anglers in SD. Visit AA-Boats-Boating.com to find information about fishing boats in South Dakota and other boating information. We are happy to post photos, stories and/or articles about your fishing experiences in SD. For kids fishing pictures and stories, we have a dedicated youth fishing section. Please take a kid fishing, take pictures and submit them for consideration. It will make them smile, again and again.